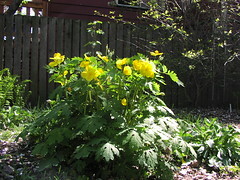 I planted several Celandine poppies (Stylophorum diphyllum) last year, and I’m so pleased with them. They popped right up this spring and are now covered with bright yellow flowers. This particular one right in front of the blackhaw viburnum is over a foot tall! I haven’t noticed any seedlings yet, but they might be pretty small compared to the ones planted las year. If you’re looking for a semi-shade plant with early flowers and good-looking foliage, Celandine poppy is a very low-maintenance option. After the longest April rain-free period in Chicago history, we are now getting rain. I’m sure the fish are grateful that their pond is now full, although I’m sure I need to supplement their salt. The trees (outside of the oaks and sycamores) are leafing out and it’s really getting green. I am just a little bit too happy about this! I’ve started my springtime mail-order spree. Even though mid-May is the traditional planting time, I think the natives will be tough enough to handle any early May chilliness. My first bunch will arrive next week from Stone Silo in northeast Wisconsin. I picked up some of their plants last year at the Green Bay Botanical Garden, and they were so strong and healthy that I decided to try to buy more of their stuff. Their prices are great, too! Now I just have to find a place for my impulse purchase of blue false indigo…. I planted 3 Caroline raspberry canes, a Tophat blueberry, English lavender, and some impulse-bought Tete-a-Tete daffodils and purple hyacinths this weekend. I keep peeking at the raspberry canes, but they insist on continuing to look like sticks unrelieved by buds. So I started dumping everything on the pile: branches, pond algae, fruits and veggies from the kitchen. The yard is a little small for a nice three-bin system, so there’s just one pile wedged between the Siberian elm and the arborvitae. I didn’t really touch the pile, because, well, it was a little scary! Lord only knows what was living in there…although when I did dig it out on rare occasions, there was some nice compost at the bottom. My non-country roots show when confronted with a pile of organic stuff that’s bigger than me. I finally tackled the pile yesterday, and decided that the branches are going to have to be mulched by the village rather that decaying ever-so-slowly in the pile. There’s just not enough room for both the branches (with a Siberian elm and an American linden, there are lots of branches) and the fruit & vegetable waste from the house. So now the pile is small and tidy and turnable and no longer up against a wood fence, and I have two bags of branches for the village. I think I’ll be able to use some of the branches for a twig fence for the side yard, but I’m going to have to admit defeat for the rest. Last year I planted mesclun and radishes for my early spring vegetable garden. The few surviving radishes were puny, and the only successful leafy greens were the mustard greens (perhaps they were too strong for the rabbits – they were definitely too strong for me). This year, I’m trying two kinds of Swiss chard. I dug in a small bale of peat moss to loosen up the nasty clay soil in the bed south of the garage before I planted. It’ll be a few days before I know whether they germinated, but I did get a fair amount of pleasure from the size of the chard seed. Unlike lettuce or radish seeds, these guys were huge! If nothing else, I think I got the seed spacing working better this year than last. Not a whole lot is in bloom yet, but I think things should look better next week! 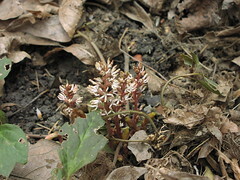 For now, the only native bloomers are Allegheny spurge (above), Labrador violets, and Pennsylvania sedge. I hope to see some spring ephemerals in the side yard soon, but not much yet. 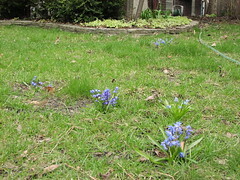 I was going to take some pictures of the scilla and chionodoxa in the front lawn, but the weather intervened. Here’s the pond, with the forsythia to the right (note that it looks the same as it did in the 29 March posting!) and some wild iris (Iris shrevei) to the left, starting to poke up in the pond. The snow is quite pretty, but enough already. I want to garden!